Dresden’s Striezelmarkt is the oldest Christmas market in Germany, so I’d be amiss if I didn’t mention it first! Not only will you find a plethora of shops selling everything from traditional handicrafts to mulled wine, but you’ll also have a chance to view the world’s tallest nutcracker! You definitely won’t want to miss the Stollen Festival, which is held in early December every year: they’ll parade a giant stollen cake through the streets, selling bits of it to anyone who’s interested—and the proceeds all go to charity, so if you want to get into the festive spirit and give a little, this is your chance! Let’s face it, no trip to Germany would be complete without a trip to the country’s beautiful capital city. And for Christmas markets, you’re in for a real treat—there are dozens of them scattered around the city! WeihnachtsZauber is one of the biggest ones in the country, drawing tens of thousands of visitors over the course of the season. And with its impressive historical setting, well—shopping for Christmas gifts has never been so picturesque! I’d recommend strolling around the city and hitting up different markets, though: they definitely all have a unique flavor to them—for example, the Staatsoper Market is a much more traditional version, while the Potsdamer Platz Market is centered around the popular toboggan run. If you thought Munich was only a place to visit during Oktoberfest, think again! Munich’s Marienplatz Market is another of the bigger Christmas markets in the world. It’s centered around an enormous fir tree that is decorated with a few thousand twinkling lights, and you’ll also be treated to a backdrop of the town hall and other historic buildings. As with Berlin, though, you’ll find that there are a number of different Christmas markets scattered around the city, and each one has a unique feel—so again, I definitely recommend checking out more than one of them if you have the chance. Another thing to love about Munich during wintertime: it makes a great base if you’re planning on doing a little skiing or snowboarding, since it’s an easy drive from Munich down to the Alps! If Rothenburg isn’t on your list of places to visit in Germany, you should definitely add it in. I can’t think of much more impressive places to host a Christmas market than a walled medieval city that keeps true to its historical architecture. And Rothenburg’s Reiterlesmarkt is definitely the place to be. Unlike the Christmas markets held in Germany’s larger cities, Rothenburg’s markets are smaller and more intimate, giving them the perfect romantic feel. The city is also famous for its tasty Schneebälle (snowballs), small pastries covered with sugar, chocolate, nuts, or really anything else. In my opinion, the Kölner Dom, or Cologne Cathedral, is one of the most fascinating cathedrals in the world—and I’ve seen a lot of cathedrals! Stick a Christmas market in front of it and you’re sure to get some incredible photos of merriment with a gorgeous backdrop. If you happen to time your visit while there’s snow swirling down around it all? You’re looking at the perfect postcard from your trip. And even if the architecture doesn’t interest you, the great thing about this Christmas market is that there are tons of performances and entertainment that go on nightly. This is my favorite Christmas market that I’ve ever been to, and it’s one of the largest ones in the world. 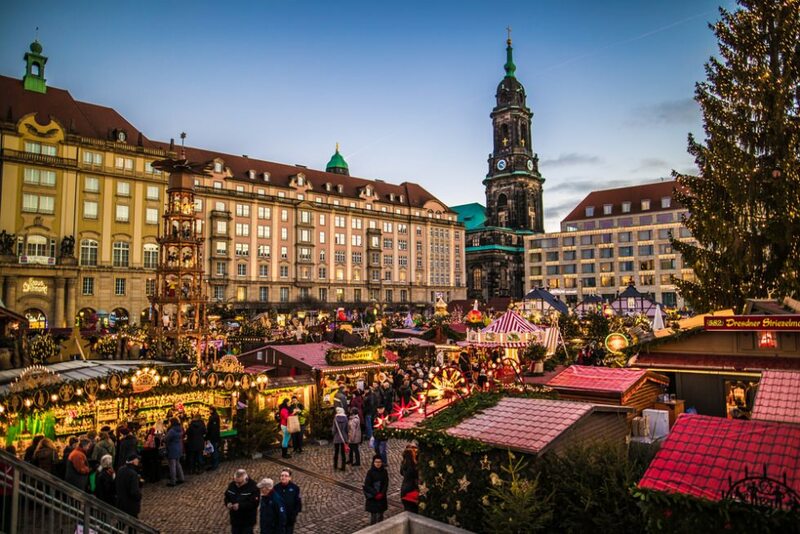 As with other German Christmas markets, you’re going to be treated to an impressive and historical backdrop, although you may not see much of it when you’re faced with stall after stall after stall of gingerbread cookies, pretzels, mulled wine, ornaments, and more! It’s one of the most authentic Christmas markets in the country—in fact, they prohibit the sale of anything modern or mass-produced, meaning that if you’re looking for beautiful, handmade gifts or other handicrafts, this is definitely the place to get them. Any Christmas market that’s held in the shadow of a castle (schloss) is high on my list, but this one is one of the most fun experiences that I’ve ever had at a Christmas market. In keeping true to its historical roots, the market is full of minstrels, jugglers, falconers, and other performers that you might have seen if you were to visit the market back in the medieval era. As you browse the stalls and sip on mulled wine, you’ll definitely feel as though you’ve stepped back in time—except you’ll stay comfortably warm in your modern fleece and jacket, rather than shivering in a fur-lined cloak! One thing to note, however: the market is only held on the weekends. Although seemingly every town and city in Germany holds a Christmas market, there are some that you absolutely have to visit if you’re lucky enough to be in Germany during the month of December. These six markets are my favorites, and you’re sure to have a magical time in them!